Summer evenings are meant to be spent outside relaxing with family & friends. Express your own personal style by bringing the warmth & charm of natural flame to your patio with the TIKI Brand belmont patio torch. It's easy 3Piece assembly requires no tools & the durable powder-coated steel construction offers seasons of long-lasting beauty & performance. Double wick technology creates a longer lasting, dancing flame to provide a natural glow to outdoor entertaining. The easy pour wide mouth canister means fewer spills & less mess for a cleaner, more enjoyable experience. Use with TIKI Brand bite Fighter fuel & enjoy Proven mosquito repellency. 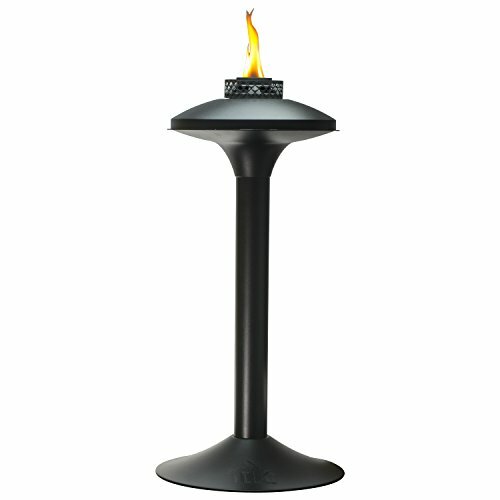 The TIKI Brand belmont patio torch stands 28" tall & comes Complete with flame guard, two long-lasting fiberglass wicks, & a Metal snuffer to extinguish the flame when the evening's over.